India, with its diverse religious, ethnic, linguistic and caste groups is said to be “the world's most heterogeneous society”. The greatest threat to the country would be favouritism by the state towards any of these groups (communalism). For good reason, Indian schoolchildren are taught about “unity in diversity” and the unflinchingly secular ethos of their nation. There has long been resentment in India against Christian missionaries from abroad who "buy" converts in the middle of a famine. Yet attempts to curtail this can interfere with Article 25 of the Constitution which guarantees "freedom of conscience and the right freely to profess, practise and propagate religion". Even today, among the tribal peoples of Jarkhand mass conversions are performed, from Hinduism to Christianity or vice versa. Although many wish to keep their own animistic beliefs, desperate poverty can make the offer of rice, milk and a free education irresistible. Only later do some discover that six months after baptism, they will have to pay school fees, after all. As one woman said, she is so poor that all she has left to sell is her religious identity. It can hard to maintain religious freedom when other human rights are not being met. This is the reason for the anti-conversion laws in some of the Indian states. They prohibit religious conversion obtained through the use of force, "allurement" or fraud and forbid anyone to aid these illegal conversions. In 2012 there was a successful challenge of one state's anti-conversion law, leading to some parts if it being declared unconstitutional. In the northern Indian state of Himachal Pradesh the High Court declared that religious freedom must include not only "the right to change faith, but also has the right to keep secret one's beliefs". This struck down that state's rules which made free conversion from one religion to another illegal unless it was preceded by a long process, including investigation and authorisation by a magistrate. An even more fundamental conflict with the secular constitution lies in the "Personal Law" which prescribes different rules for members of various religions in areas like marriage, divorce and inheritance. For in India there is no law code that applies to everyone in every area of life. Yet even almost 70 years later there seem to be no realistic prospects of this happening any time soon. Instead, there are still special laws for people of various religions which keep their personal affairs under the control of the religious authorities and local custom. Changing these laws has proven to be easier for the Hindu majority than for India's largest minority, the Muslims. 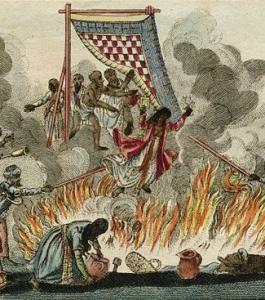 The modernisation of the laws regarding Hindus started with the abolition of the sati, the religious and social obligation of a widow to be burnt to death on her husband's funeral pyre. This was first banned in 1829 by a British Governor of the East India Company and a Bengali reformer, after his own sister-in-law had been burnt to death. The Hindu Widows' Remarriage Act of 1856, passed during the British Raj (1858–1947), was designed to give these women a second chance. Further measures followed, such as the Married Women's Property Act of 1874, which was created to protect the properties owned by women from relatives, creditors and even from their own husbands. A bundle of post-Independence government measures, the Hindu Code Bills (1955), carried this process further. And Hindu Personal Law was also modernised by compliance with the the Child Marriage Restraint (Amendment) Act 1978 which requires brides to be least 18 years of age. But what of the Muslim women? 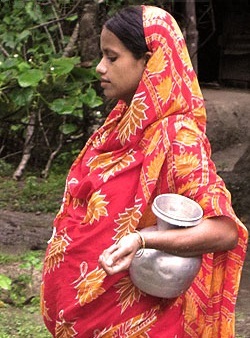 Indian Muslims are poorer and less educated than average and Muslim women have less access to contraception. They are also still governed by colonial-era acts which put them under Muslim civil law, in other words, that part of Sharia that does not involve “criminal” offenses. These are the Muslim Personal Law (Shariat) Application Act (1937) and The Dissolution of Muslim Marriage Act (1939). Under the first, Muslim women can still be married off as children, be obliged to share a husband with other wives and have their marriage ended if the husband tells them three times, "I divorce you". This grass-roots research makes the constitutional world of the eminent Australian jurist, Michael Kirby sound a bit like a fairytale. He says that, according to the Indian ideal of secularism, "the state may act as a beneficial regulator, accommodating and facilitating religion in the public sphere so long as it ensures that no one religion dominates". That may keep the mullahs from being dominated, but what about the Muslim women? And what about the Hindu women who, despite the often more modern laws prescribed for them, find that these are not enforced? Of course, under Muslim Personal Law, some of this this is perfectly legal. However, there are huge numbers of Hindu child brides, too, despite the fact that the present Hindu Personal Law should ensure that brides are at least 18 years of age. Especially in rural areas, the law can collide with economic necessity and tradition. The marriage of a minor girl often takes place because of the poverty and indebtedness of her family. Dowry becomes an additional reason, which weighs even more heavily on poorer families. The general demand for younger brides also creates an incentive for these families to marry the girl child as early as possible to avoid high dowry payments for older girls. The girl in our patriarchal set up is believed to be parki thepan (somebody’s property) and a burden. These beliefs lead parents to marry the girl child. In doing so, they are of course relieving themselves of the ‘burden’ of looking after the child. The girls are considered to be a liability [...] Unfortunately, the patriarchal mindset is so strong that the girl has no say in decision making. Texts like Manu Smirti which state that the father or the brother, who has not married his daughter or the sister who has attained puberty will go to hell are sometimes quoted to justify child marriage. Child marriages are also an easy way out for parents who want their daughters to obey and accept their choice of a husband for them. The ending human rights abuses is the real meaning of the separation of state from church, temple or mosque. However, founding an overwhelmingly Muslim state did not prove to be the solution for religious tensions. There has been sporadic violence between the majority Sunni Muslims, the minority Shias and the Ahmadis who, in a 1974 constitutional amendment, were defined as non-Muslims — despite what they themselves maintain. It is often incorrect to link a violent incident to religion alone, at least in India’s case. In India, we use the word “communal” – as opposed to “religious” – to suggest that the motives could range from a clash of worldly interests to the political targeting of one community. In fact, though communal violence does pit one religious group against the other, political disagreements are the most prevalent cause of such violence. 6. "Indian Court Suppresses Part of Anti-conversion Law", Zenit, 2012-09-03. 8. "Muslim personal law can't override criminal law: Court", Press Trust of India, 2013-09-23. 9. Lucy Carroll (2008). “Law, Custom, and Statutory Social Reform: The Hindu Widows' Remarriage Act of 1856”. In Sumit Sarkar, Tanika Sarkar (editors). Women and social reform in modern India: a reader, p. 79.